Rosy the Reviewer: Rosy's Test Kitchen #3: Cooking Successes and Cooking Conundrums - "Soup, Salad and a Sandwich"
Rosy's Test Kitchen #3: Cooking Successes and Cooking Conundrums - "Soup, Salad and a Sandwich"
If you have been following me on this new little cooking venture I have embarked upon, you know that I had some problems in my first installment but did much better in Installment #2, where I shared a Moroccan Chicken Vegetable Soup and some of my comfort food favorites. Today, it's all about soup, salad and a sandwich. I have already professed my love of soup in the last installment, so I don't need to go into that again, but salad. A good salad with a nice piece of protein is probably the perfect meal. And a sandwich? Comfort food extraordinaire. Oprah has been known to wax poetic about her childhood and the joys of eating Campbell's tomato soup and a grilled cheese sandwich. I, too, found that combination a childhood favorite. If it's good enough for Oprah, it's certainly good enough for me! 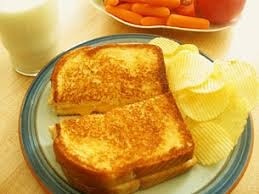 THE BATTLE OF THE GRILLED CHEESE SANDWICHES!! And naturally, since this is my blog, I will be the judge! 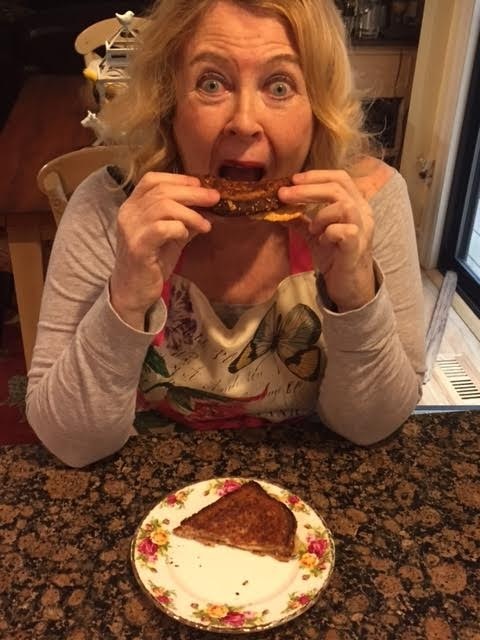 I think I already shared my fool-proof method for making the best grilled cheese sandwich, but I will share it again here. I bake it! No chance of burning the bread and it comes out perfectly every time. 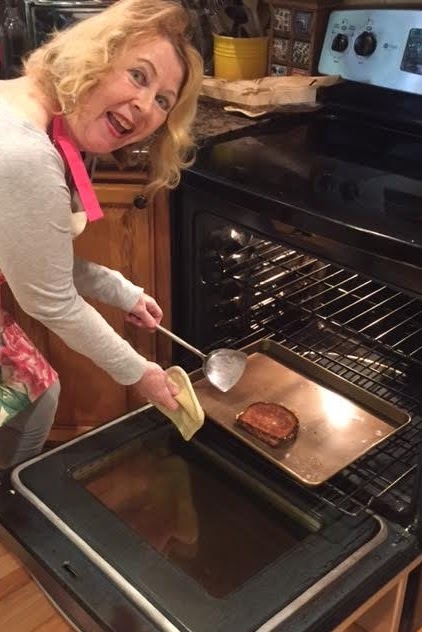 "Rosy's Baked Grilled Cheese Sandwich"
Set the oven at 425 degrees and put a baking sheet into the oven to warm while the oven is heating up. Butter two pieces of bread on one side (some people swear by using mayo instead of butter, but I tried that and thought it made the bread greasier and tougher but do what you want with that). When the oven has reached 425, pull out the baking sheet (be sure to remember to use an oven mitt or potholder), place one slice of bread buttered side down, layer on your cheese (I use Kraft singles - 2 and a half slices - but you can use higher end cheese if you like. I just think the singles melt more evenly. I know, I know, those Kraft singles aren't really cheese, but I like them. It's a childhood thing). Top the first piece of bread with the other buttered slice, buttered side up and place the baking sheet with the sandwich on it into the oven. Bake for 8 minutes (but depending on how brown you like your sandwich and how hot your oven bakes, you might want to check it at 5). Then flip the sandwich over and bake for another 5 minutes or so (again checking as you go). So now my method of making grilled cheese sandwiches is going up against the famous "Waffle Iron Grilled Cheese Sandwich," "The Low Fat Grilled Cheese Sandwich," that uses low fat cream cheese for some of the cheese and is grilled in olive oil instead of butter, and the "Knife-and-Fork Grilled Cheese with Honey" from the restaurant at the Las Alcobas Hotel in the Napa Valley and recently featured in Food and Wine Magazine (May 2017). First, let's try the waffle iron version. Heat the waffle iron, butter the bread, layer the cheese, put it in the waffle iron butter side up and cook for about two minutes. What I learned: Looking easy does not an easy or good recipe make! Yikes! I don't know what I did wrong, but it came out a gooey, greasy mess! 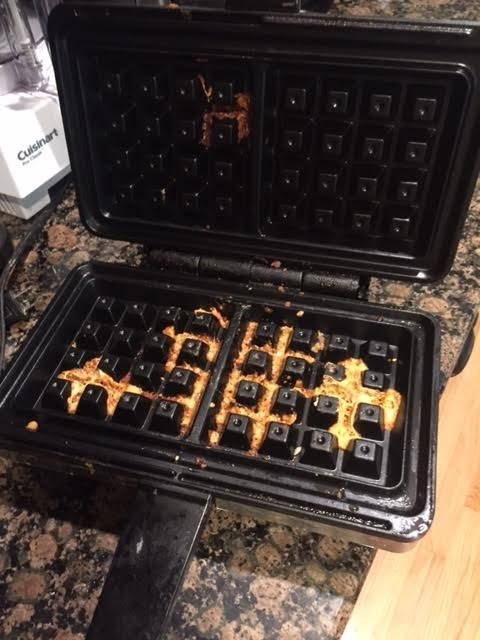 And...anyone know how to clean melted cheese out of a waffle iron? "The LOW FAT GRILLED CHEESE Sandwich"
First, that sounds like an oxymoron, but if I could eat my beloved grilled cheese sandwiches and not have to worry about so many calories, that would be a plus. And this recipe assured me that the addition of low fat cream cheese would make up for the low-fat cheese, which is not known for its creamy consistency when heated. Combine 1/2 oz. 1/3-less-fat cream cheese and 1 t. canola mayo. Add 1 oz. 2% reduced-fat grated cheddar cheese. Spread between two slices whole-grain bread. Sear each side in a skillet over medium heat in 1/4 t. oil until bread is browned and crisp and how you like it. What I liked: Swapping the olive oil for butter saves 7 grams of fat, and the cream cheese and mayo helps the low fat cheese melt to give you that pleasant mouth feel we all crave when we eat a grilled cheese sandwich. What I didn't like: how do you determine a 1/2 oz. of cream cheese or 1 oz. of grated cheese? You could weigh it or eye-ball it. Just do the best you can). 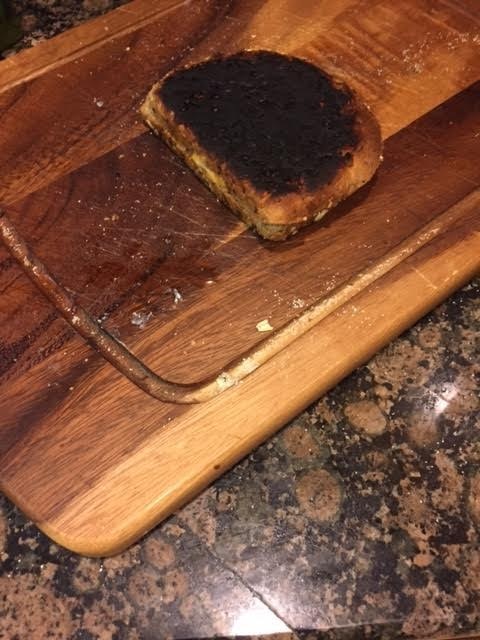 What I learned: I told you I don't like frying my grilled cheese sandwiches, which is why I prefer baking them, but I learned that it's probably not a good idea to run out to the mailbox while frying my grilled cheese sandwich. However, I was able to eat one side of the sandwich, the side that wasn't burned, and it was quite tasty - but not as good as mine! "KNIFE-AND-FORK GRILLED CHEESE WITH HONEY"
(as served at the Las Alcobas Hotel in St. Helena, California). Spread the butter on one side of each piece of bread. Top the unbuttered side of the bread with the cheese, close the sandwiches and press down lightly to flatten. Cook the sandwiches in a large griddle or skillet on moderate heat until golden, turning once, 3 to 4 minutes per side. Transfer to a plate and drizzle with honey and season with salt and pepper. 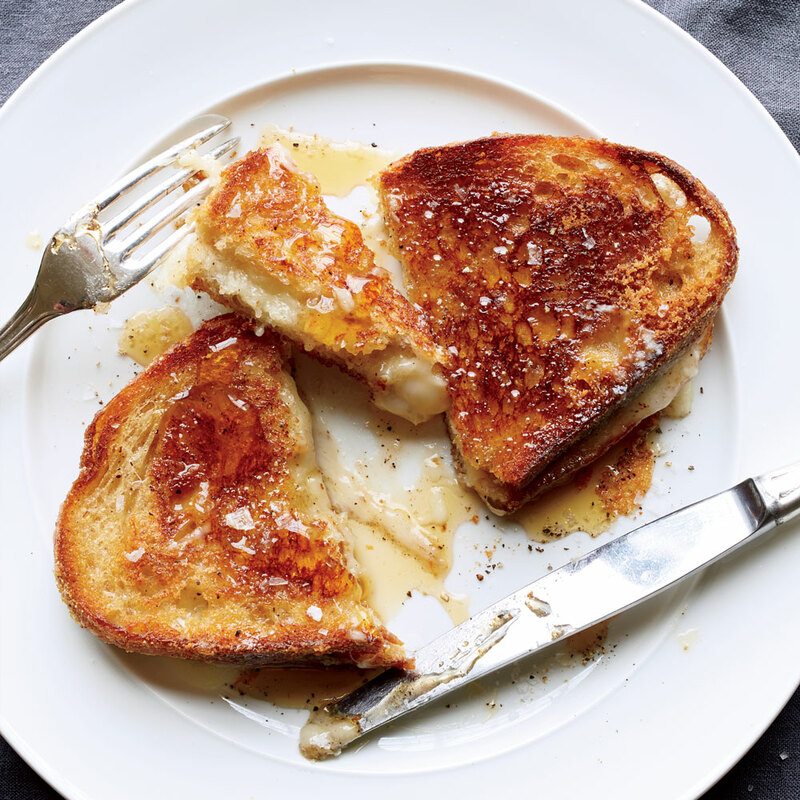 What I liked: adding honey to a grilled cheese sandwich? Sounds good! What I learned: I can't find Taleggio cheese (but you can probably substitute Fontina). Verdict: I didn't even try it because I couldn't figure out what a boule was so if this sounds good to you and you are lazy like I am, make your grilled cheese however you like it and toss some honey on it! Done! WINNER OF THE BATTLE OF THE GRILLED CHEESE SANDWICHES???? Now on to the soup and salad. Warning: this is a mélange. These next two recipes are not necessarily meant to be eaten together or with the aforementioned grilled cheese sandwich...unless you want to, of course. Who am I to say that it's not OK to eat a grilled cheese sandwich with tortilla soup and a Burger Patty Salad? I absolutely LOVE tortilla soups and I have tested more recipes for tortilla soup than I care to count but this one is the best...and the easiest. However, who'd have thunk it? I found this one in one of those little booklets that sits in racks at the checkout stand at the supermarket. You know, one of those "50 Soups That Will Change Your Life" kinds of things. You know what I mean. But anyway, this is a killer tortilla soup. But here is the REAL KILLER. It's a slow-cooker recipe! You see, my crock pot and I do NOT get along. 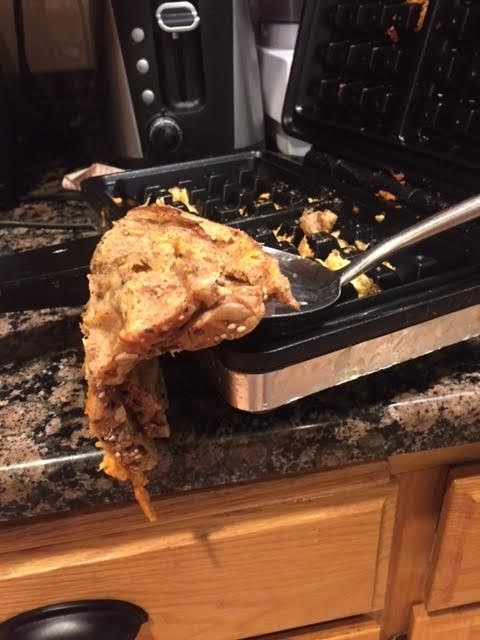 I keep trying to give it a chance and every single time that darn crock pot lets me down. Everything comes out tasting bland or soggy. But this one dish is the exception and it's the best tortilla soup recipe to boot! It's easy and delicious. 6 boneless skinless chicken thighs (1.25 pounds) but I use more. Cook on low for 5-7 hours. Stir to break up the chicken thighs and then stir in two chopped tomatoes (I don't bother to seed them) and as much cilantro as you like. What I Liked: Three easy steps. 1) - Throw everything into the crockpot 2) - Garnish 3) Eat! What I didn't like: I still don't like crockpots much. 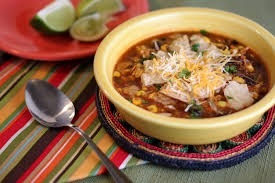 What I learned: More chicken, more broth works the best and use a few more tortillas and a bit more corn if you like. Verdict: Successful and delicious! Ole! The name of this salad does not do it justice. Burger Patty sounds like something from McDonalds. However, I promise you, this is a very delicious and high end salad despite its unfortunate name. When combined, add 6 oz. lean ground beef, 4 oz. ground lamb (if using) - or 10 oz. of just ground beef - and 1 large egg. Pulse in the food processor to combine. Mix those ingredients and then add 1/2 of a grated English cucumber to the mixture. The recipe calls for a 5 oz. bag of baby kale but use whatever greens you want. Toss the greens with 1 T. oil and 1 T. fresh lime juice. Divide greens onto 4 plates and top with the other half of the English cucumber, sliced, as much of the remaining red onion as you want and several wedges of tomatoes. 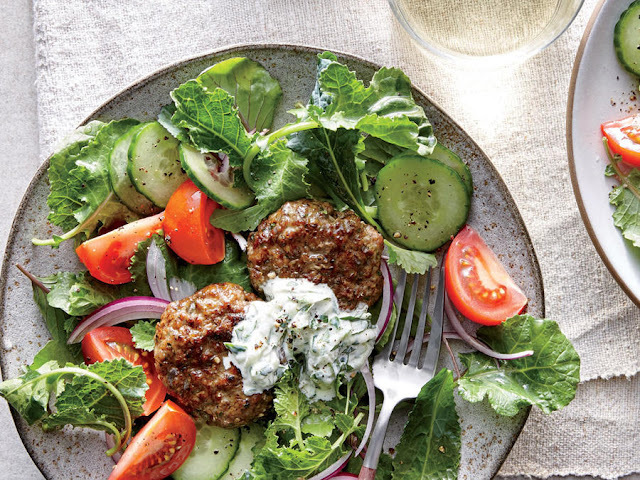 Put two meat patties on each plate and garnish the patties with the yogurt mixture. Shape the meat mixture into 8 patties, place them on a jelly-roll pan or baking sheet coated with cooking spray and broil for 6 minutes or until done. When you make the burger patty, you will swear that it just won't work because the ground beef mixture is so oozy and runny but as soon as you make the mixture into patties and put them under the broiler they come out moist and delicious. What I liked: Nothing is better than a lovely salad and a bit of protein and the Middle Eastern flavors give it just the kick it needs to stand out. What I didn't like: They need to change the name of this recipe. What I learned: This recipe calls for a mixture of ground beef and lamb, but I made it with just the ground beef and it was really good. However, I would think that adding lamb (if you like lamb) would give it an extra little kick. I will try it with ground lamb next time, though I not only don't see ground lamb much at my supermarket, I also have a bit of a hard time eating little lamby-kins. So that's it for this installment. Join me next time when I will be sharing my favorite "sweets" with you. I made the Tortilla Soup today and it was delicious. And I made it exactly as the recipe is written because it irks me to no end when recipe commenters say things like, "Great recipe! I substituted rice for the garbanzo beans, left out the canned chiles, added spaghetti sauce and a cup of sugar, and it was perfect!" Why review someone's recipe if you are going to completely change it? So, with that in mind, everything was perfect. The tortillas dissolved wonderfully, the garbanzo beans (which I usually abhor) were pretty benign, the spice level was just right, and the liquid level (2.5 cans) was just between being thick and thin. The best part was, I was able to put it togetehter and surprise my husband (who usually does the cooking!) with a completed dinner at meal time. Muy bien! So glad you liked the soup. It's definitely my go-to for tortilla soup!